Ever since hit single Rocket Man began a run of 16 consecutive top 20 hit singles in 1972, Elton John has been an international music superstar. Credited with returning the piano in popular consciousness to the role of a percussion instrument, he is responsible for classic songs such as Nikita, Saturday Night's Alright for Fighting, Don't Let the Sun Go Down on Me, Tiny Dancer, Sacrifice and I'm Still Standing. Elton also won an Oscar for his work on the Lion King soundtrack, including the song Can You Feel the Love Tonight? 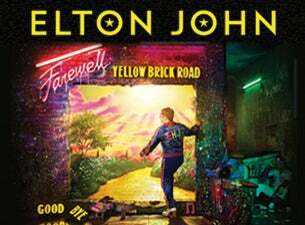 Elton recently announced two massive outdoors shows for June 2019, marking the first UK dates of his recently revealed Farewell Yellow Brick Road tour. The musical legend will take to The 1st Central County Ground in Hove on 9 June 2019, and Cardiff City Stadium on 15 June 2019. The latter has been confirmed as Elton’s last ever show in Wales. Throughtout 2019 and 2020, Elton John will also play a host of UK arena dates including four nights at London's O2 Arena. The news comes as Elton prepares to kick off his eagerly anticipated Farewell Yellow Brick Road tour in Pennsylvania. The star confirmed his final run of live dates back in January at Gotham Hall in New York. The full tour will consist of more than 300 shows across five continents, set to reach its end in 2021. As one of the top-selling solo artists of all time, Elton has 38 gold records to his name, with over 50 Top 40 hits. He has sold more than 300 million records worldwide and holds the record for the biggest-selling single of all time, selling over 33 million copies of 1997's Candle in the Wind. As well as dominating the charts, Elton has written music for stage and screen, and continues to be a key activist in the fight against HIV/AIDS. He established the leading non-profit HIV/AIDS organisation Elton John AIDS Foundation, raising over $400 million to date.